Creamy Chicken Taquitos. I love them! I originally posted the recipe in my first year of blogging, nearly 5 years ago! I still make them all the time but my methods have changed a bit. I now triple the recipe. Yep, I cook up an entire bag of frozen chicken and move on from there. 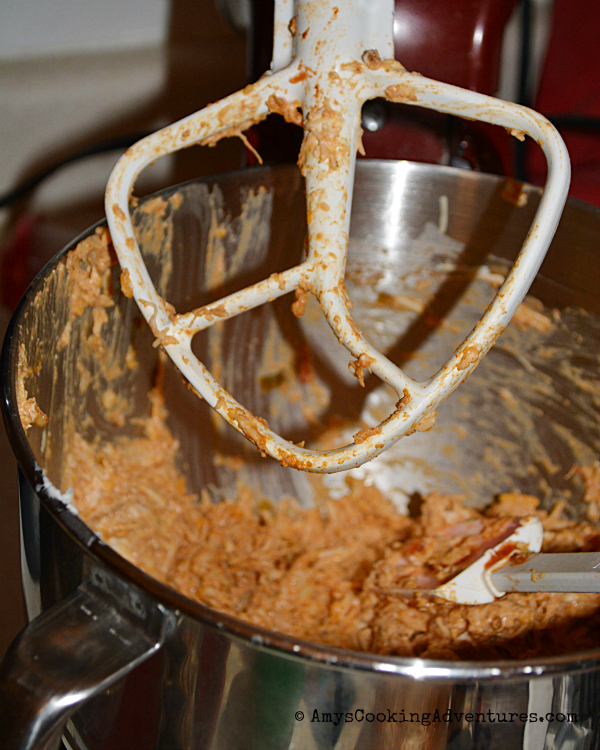 I also use my stand mixer to make an easy recipe even easier! The stand mixer shreds the warm chicken so quickly! Plus it mixes the rest of the ingredients wonderfully! Once they’re all made, I cook however many we plan to eat (usually 3 for Hubs, 2 for me, & 1 each for the kiddos), and freeze the rest. Have I mentioned that they freeze beautifully? I shove as many as I can into a freezer bag, then I pull out however many I need later on and cook them from frozen. Couldn’t be easier! Bring a large pot of water to a boil. Add the chicken (frozen is ok!) and boil until the chicken is cooked through, about 20 minutes (up to 30 minutes if the chicken is thick or frozen). Move the cooked chicken directly from the pot (let the excess water drip off) into the bowl of a stand mixer fitted with the paddle attachment. Mix on low speed until the chicken is evenly shredded. Add everything else (except the tortillas). Mix on low again until all the ingredients are evenly combined. Preheat the oven to 425 degrees F. Line a baking sheet with parchment paper or a silicone mat. Place each rolled tortilla, seam side down, on the prepared baking sheet, placing the tortillas 1 ½ inches apart. Bake for 10-15 minutes, until crisp and lightly browned. 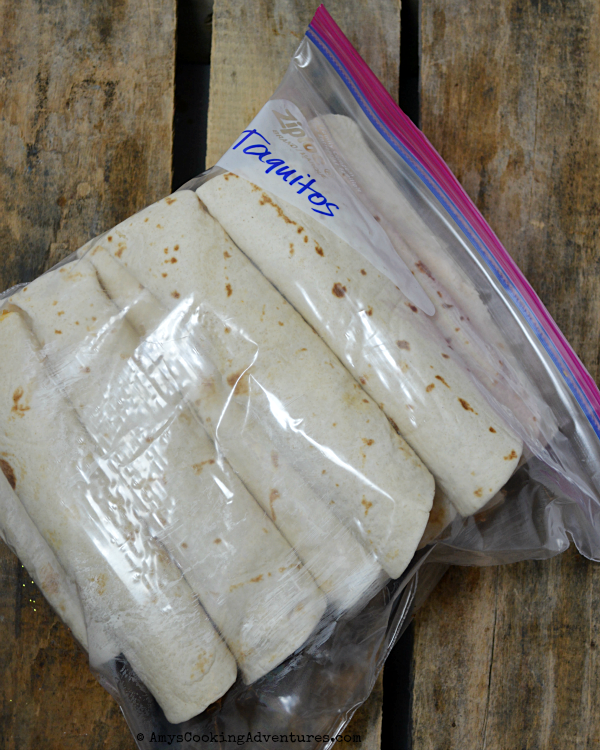 Alternately, place the rolled taquitos in a freezer bag until ready to eat. 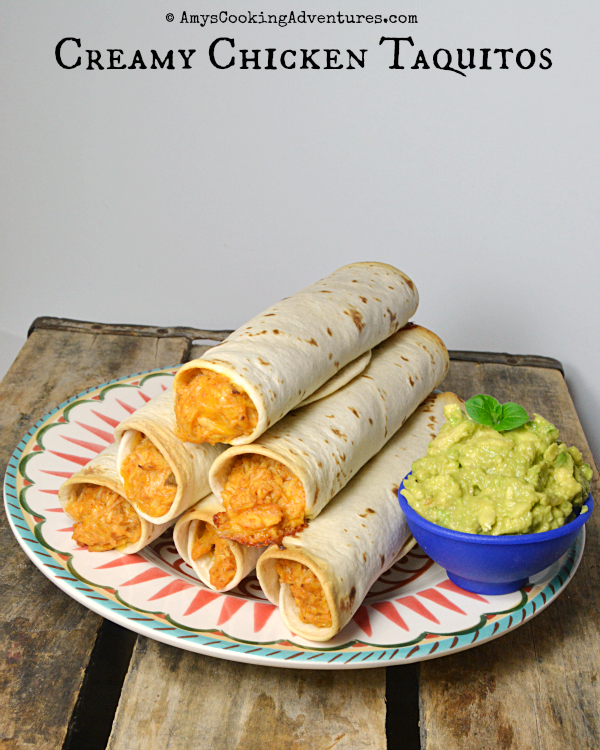 To cook, place the frozen taquitos in the preheated oven and cook for 15-20 minutes or until heated through and crisp. 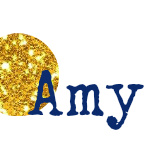 Perfect recipe Amy and they would be great for a superbowl party where you are feeding a large group. 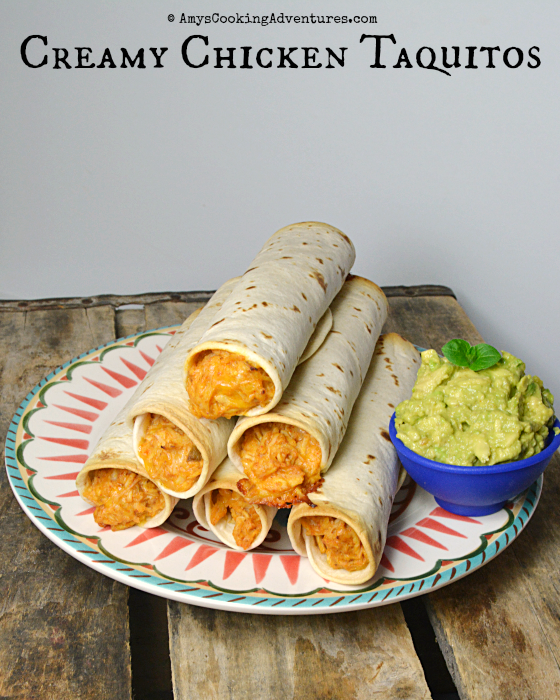 I love Taquitos but have never made them at home. I don't know why. This I can do. Best of all I love a recipe that I fix on one day and have food for several meals. I can't wait to try this. Thanks and thanks for visiting my blog.